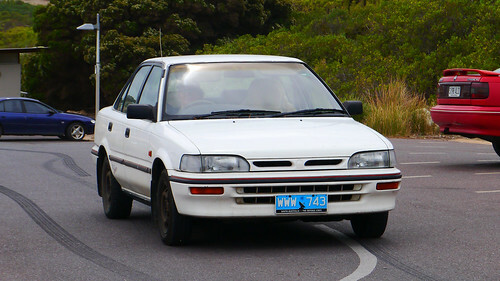 The LE series, based on the Corolla E90 was sold between August 1989 and September 1994. It was offered with Toyota’s 1.4 litre 60-kilowatt (80 hp) engine (hatchback only) and 1.6 litre 67-kilowatt (90 hp) engine, in Holden’s traditional SL (hatchback only), SLX and SLE trims. The Holden Nova is a compact car that was produced by the GM-Holden-Toyota alliance, known as United Australian Automobile Industries (UAAI) in Australia between August 1989 and 1996. The alliance, and therefore the car, was a result of the failed Button car plan which attempted to rationalise the Australian car manufacturing industry. The Nova was sold and marketed under the Holden nameplate, although it was a badge engineered version of the Toyota Corolla, receiving minor stylistic changes. The Nova was sold only as a four-door sedan and five-door hatchback. In all years, the Nova was outsold by the Toyota Corolla in Australia, and the car was replaced by the Holden Astra in 1996.